Designed for Dirt and Asphalt Late Model, IMCA Modified, Street Stocks. 2 sizes available (15″, 16″). Constructed from TIG welded .100″ 5052 grade aluminum. Additional MIG welding adds strength. Contoured elongated bottom for added thigh and hip support, also has built in leg supports. Energy absorbing low rebound pad on bottom, rib and shoulder supports. 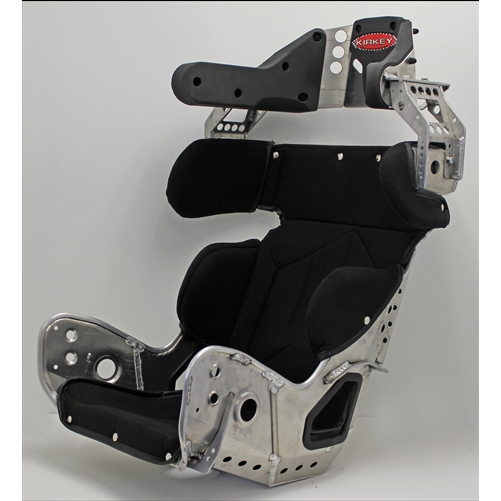 Head restraint is adjustable both vertically and laterally and uses molded high density energy absorbing impact pads that eliminate upholstery. Head restraint also rotates down for additional peripheral vision.